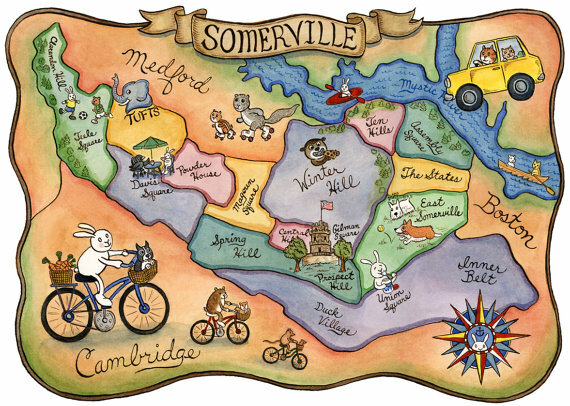 About Us | We Are Based In Somerville! Local, honest, and fair. Since 2011, we have been providing quality mobile locksmith services to Somerville and surrounding communities. We are members of the Mass Locksmith Association and National Locksmith Automobile Association; and are bonded and insured. Please take some time to read on to learn about the services we can offer you. If you are locked out of your home, car, or business - look no further. We will quickly respond and take care of the situation. We pride ourselves on fast, friendly, and fair emergency service. Our techs are professionals who are properly trained in the field and in treating you right. Car unlocks: We will use non-damaging techniques to unlock your vehicle. All our service vans have the ability to make you a spare key, or a wallet key. Home / office unlocks: We will unlock your home or business in a non-damaging manner nearly 100% of the time. On occasion (such as high security locks, or mechanical problems) drilling of the lock may be required, but all repairs are completed onsite at the time of the visit. 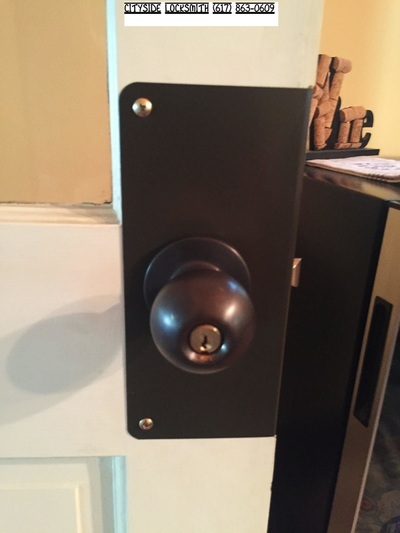 Any damages are completely restored, usually new hardware is keyed to match the existing key. Lock changes / re-key / installations / repairs: We offer these services 24 hours a day. It is stressful to need emergency service of any type. We are committed to friendly, fair service to you. We are a full service Somerville automotive locksmith service. This entails many services that we bring to you, and much cheaper than the dealership. There are many services a mobile auto locksmith can offer that people are ofter not aware of. Car keys made for your car, even when there are none. Repairs to your ignition lock that won't turn, or intermittently works. Keyless entry remotes supplied and programmed to your car. Lock re-keys for your car. If you have any key or lock problems with your vehicle, then Cityside Locksmith is the best place to call. For more in depth information on our car locksmith services, then visit our automotive locksmith site. When calling an automotive locksmith, be sure to not fall for bait and switch tactics, which unfortunately have become all too common in the locksmith industry. Be sure that you are quoted either a flat rate cost or a range. If you are quoted low minimum prices, such as $15 for a technician to come to you, and then a minimum $90 for a replacement key (or $35+ for car unlock)- then you should probably look elsewhere. Companies that quote minimums are typically national call centers who employ shady subcontractors who will overcharge you by a lot. A reputable, honest locksmith company will know what the job entails and will be able to tell you what the cost will be, over the phone. Acura, Audi, Buick, Cadillac, Chevrolet / Chevy, Chrysler, Daewoo, Dodge, Eagle, Fiat, Ford, Freightliner trucks, Geo, GMC, Hino trucks, Honda, Hummer, Hyundai, Infiniti, International trucks, Isuzu, Jaguar, Jeep, Kenworth trucks, Kia, Land Rover, Lexus, Lincoln, Mack trucks, Mazda, Mercury, Mini, Mitsubishi, Nissan, Oldsmobile, Peterbilt trucks, Plymouth, Pontiac, Saab, Saturn, Scion, Subaru, Toyota, Volkswagen / VW, and Volvo. Prices from locksmith to locksmith can vary a bit, so it is important to call around for quotes. Do not contract a company that is unwilling to quote a flat rate price over the phone. Call Cityside Locksmith for a quote today. We aim to keep our prices low and very competitive, while offering quality keys and remotes to you. We are fluent in repairing many types of car ignitions. Experience is key when dealing with a failed ignition. Common ignitions to experience problems are Honda 2003, Toyota, Chrysler (Dodge, Jeep, Ram), and Ford. Call us for a fast emergency service, or just to get a quote. Our prices are very competitive. The reasons why calling a locksmith is a much smarter decision vs calling the dealership are cost and convenience. The dealer will require that you have your vehicle towed to them, have you waiting usually for most of the day, and they will charge you expensive rates for what is essentially the same service provided by a car locksmith. A mobile locksmith will come to you, get the job done quickly and at a fair price. Cityside Locksmith | Residential Locksmith Somerville, Mass. Somerville has a lot of older housing, and usually as a result, many older style locking systems. We are fluent in repairing these locks, and also modernizing the setup with easier to use, durable, pick resistant or high security locks. You will be in good hands by calling a professional who is very experienced with the many types of locks in use in Somerville. Whether you need a lock repaired or are looking to bolster your security level- we will offer advice, solutions, and make them happen; all at a fair cost to you. No job is too small for Cityside Locksmith. 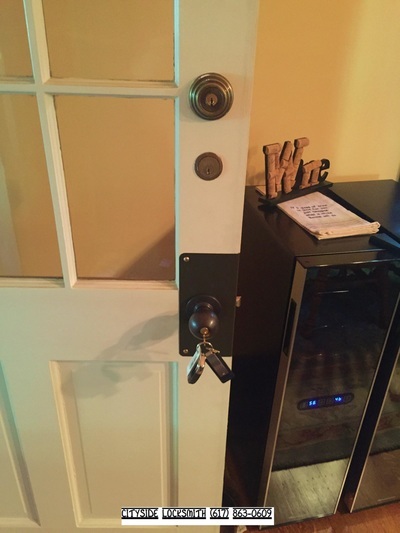 We are the first choice for a residential locksmith in Somerville. Nearly all locks can be rekeyed to a new key, to match the keys of another lock, or so multiple keys will work (master keyed). A rekey of a lock changes the internals so that all old keys will no longer work, while a new set of keys will work. Locks on a property can be keyed so one key will operate a series or all locks (keying alike). In addition, a master key system can be designed in which a master key operates all locks on a property, and sub master keys can only operate a desired lock or several locks. Master keying is common in multi-family housing. Locks not working properly can be the result of many different factors that can affect your hardware. 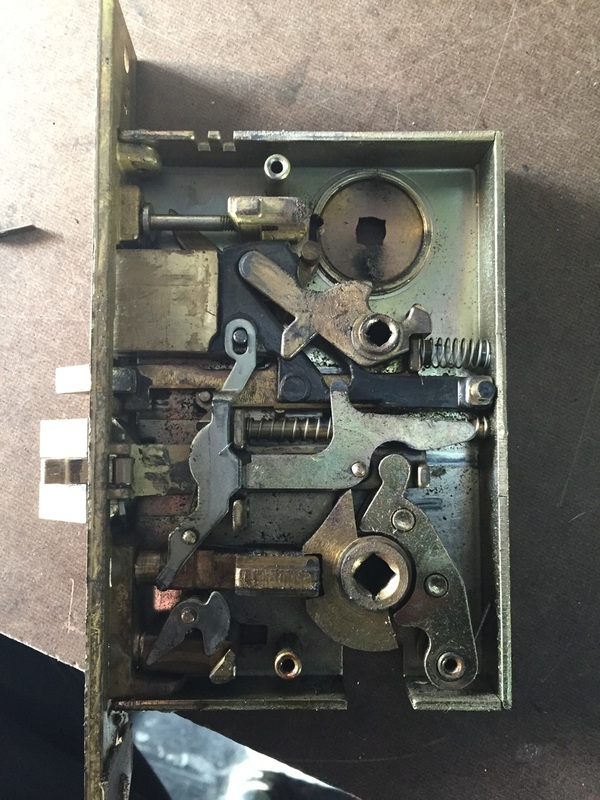 The quality or age of your lock can play a part in it not working right. Improper install or misalignment of the frame strike plates can also have a role in a lock breaking. 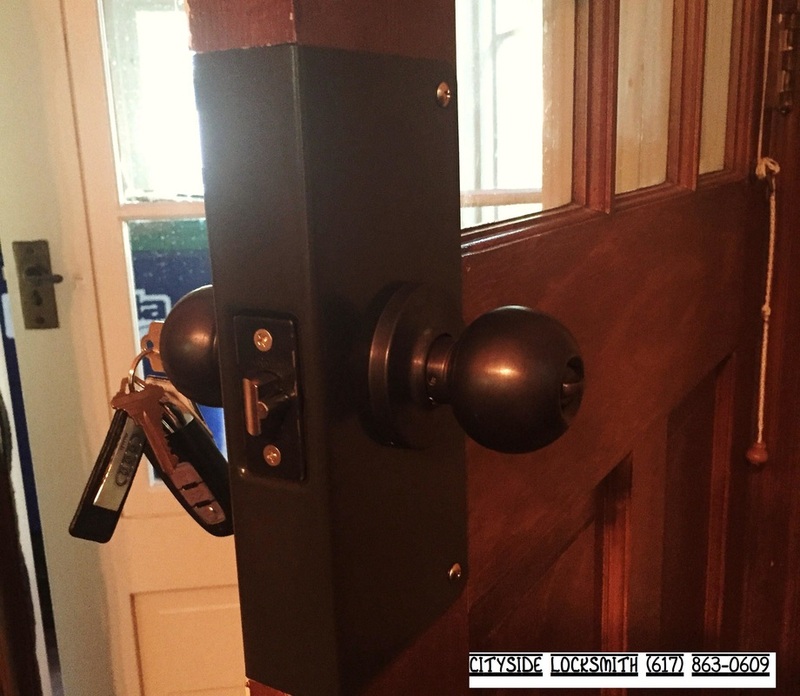 So when we repair a lock, we also look to resolve any other issues with the door and frame that can cause a lock to fail. Quality locks and also quality installation is important in a lock operating well and lasting a long time. We stock quality parts and replacement hardware in each of our service vans. Old locks, such as mortise locks that were installed original to your home, are reaching a time where they either need an overhaul or replacement. We specialize in modernizing doors to accept newer style locks of good durable manufacturers. We also can order decorative hardware from a catalog and professionally install for you. We carry hardware catalogs on our service vans. 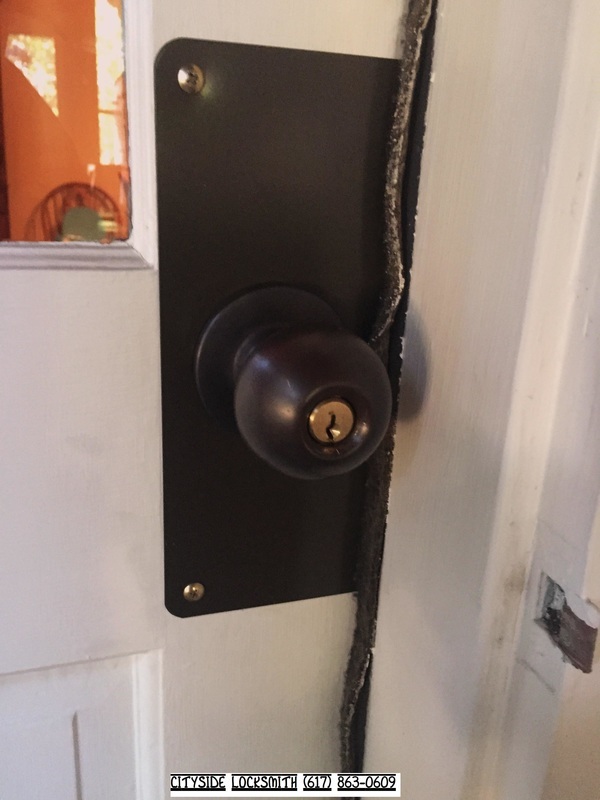 Below, see images of a finished retrofit install in Davis Sq., Somerville- in which we removed a failed mortise lock and installed a door reinforcement plate and commercial grade lockset. Each of our mobile locksmith service vans is fully stocked to handle all commercial jobs. We carry only the best quality hardware and supplies, and are experts in commercial tasks. If you own or manage a business in Somerville and are in need of a locksmith, then choose Cityside Locksmith. We are the best choice as we provide same day service, 7 days a week, and bring the shop and skill to you. 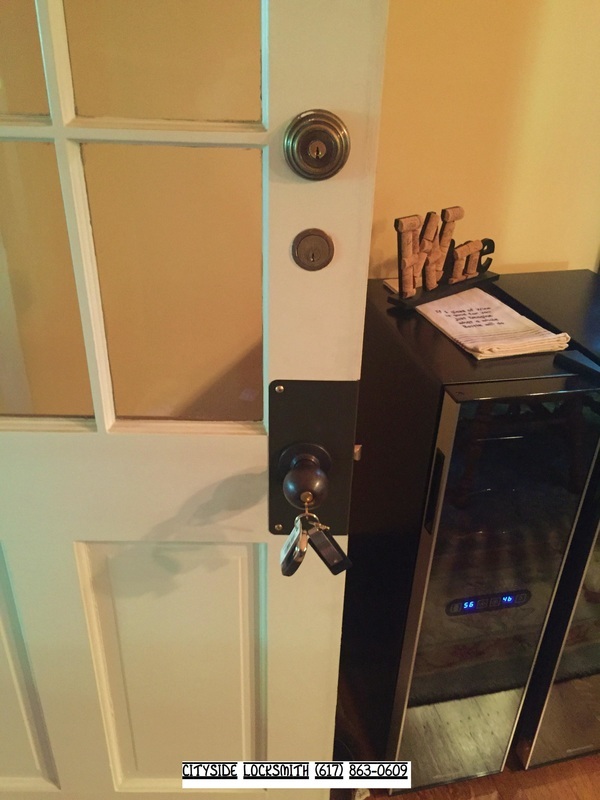 We offer many services available to you such as master keying, interchangeable core, re-key service, fire rated hardware installation, ADA compliant locks, keyless entry locks, repairs and service. We are the one-stop solution to your business needs in Somerville, MA.